Home » american thinker , antifa , Brett Kavanaugh , constitution , domestic terrorism , elon university , federal government , government , liberalism , Megan squire , supreme court , united states » Chris addresses the Brett Kavanaugh confirmation and declares war against hate at Elon University... with his FIFTH article for American Thinker! Chris addresses the Brett Kavanaugh confirmation and declares war against hate at Elon University... with his FIFTH article for American Thinker! This past week has seen the writing of my second-ever work of short story fiction (while stranded in a motel room along with Tammy the Pup during Hurricane Florence) after trying for decades to crack that art, work begun on a one-act play, finally started plotting a children's book(?!?). And now, it's article #5 written for American Thinker! 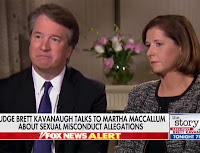 "There's Poisoning the Well, and Then There's Borking the Well" is my take on the Brett Kavanaugh nomination for the United States Supreme Court. However, that's just the peripheral matter of a way bigger issue: that for sake of partisan power there are some - and I'm looking at you in particular, Senator Feinstein - who are enthusiastically willing to trample upon a millennia of legal tradition in abandoning the rule of law. And when that is allowed to transpire, all of us as a people suffer its consequences. 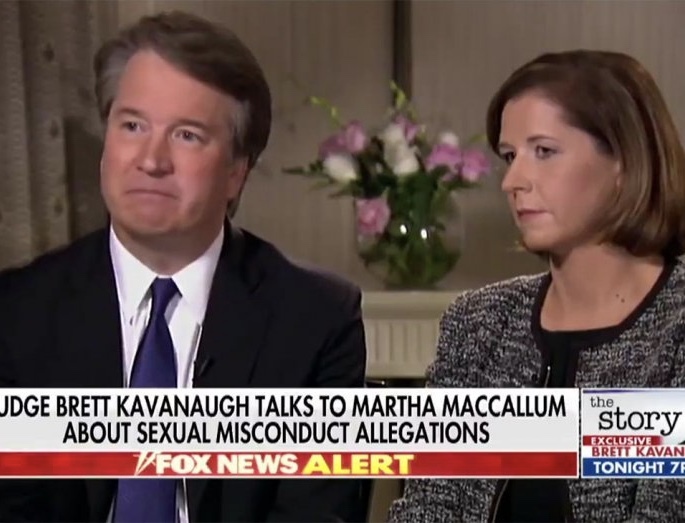 The machinations currently deployed against Brett Kavanaugh stem from a heart of darkest cowardice. If his detractors cannot prevail on purely rational and intellectual grounds, then they will do so playing to the basest hysteria and hate. There will be no satisfying their bloodlust until Kavanaugh's haggard, weary face is up on the telescreens, accusing himself of crimes against Big Sister that he never committed. So it is that the yet to be substantiated claims of Ford and Ramirez are now enough, we are told, to override fair and due process. Strangely, this principle never seemed applicable to Juanita Broaddrick, but I digress. But... that's not all, folks! Because something else gets touched on in my new article and this one is much more personal. It is this: that in the article I'm calling attention to the fact that Elon University - the college I could once be proud to call myself an alumnus of - is now harboring, employing and celebrating someone who has been taking an active part in the harassment of many innocent people, for no reason other than their holding to political beliefs she does not agree with. Megan Squire, an Elon computer sciences professor, was revealed earlier this year to be an Antifa activist. She is, for all intents and purposes, an enabler of domestic terrorism. Yeah, I said it. I went there. And from where I'm sitting it's plenty enough cause for myself and other alumni to withhold our contributions to Elon. The ol' alma mater already lost my contributions earlier this year – a consequence of Wired revealing that one of Elon's computer professors is Antifa activist who has been compiling a massive database of anyone she deems Lebensunwertes Leben. That means "Republicans," "conservatives," "Alt-Right," "white supremacists," and pretty much everyone listing starboard of Friedrich Engels. Megan Squire is not only still employed at Elon, but applauded. Last week Squire delivered a "Distinguished Scholar Lecture" about her work supplying the Southern Poverty Law Center with information about their common enemies. This is the same Southern Poverty Law Center whose "hate list" has been used to target innocent people for assassination. Curiously, Squire's work is totally absent any analogues from the left of the political spectrum. A "scholarly oversight," no doubt. Once upon a time, Elon University was a place that encouraged freedom of ideas and vigorous debate. But as ideological homogeneity has prevailed upon "the most beautiful campus in America," that time is now past. The school that welcomed Margaret Thatcher to dedicate its student center in 1995 would probably have the Iron Lady arrested for trespassing were she still with us. In good conscience, I can no longer contribute to a school that has embraced intellectual intolerance and has abandoned reason for capricious "feelings." Neither can I endorse my college when it continues to have among its staff a gleeful provider of resources for domestic terrorism. But still, I held out hope that sanity there might yet prevail. As ever, in conveying my thoughts for publication I do my best to steer away from partisan labels and identity politics. As I told a colleague today: "I deal in ideas, not ideologies." But regardless of where you're coming from on the political spectrum, I like to believe that very, very few of us are comfortable with the knowledge that anyone is being targetted for harassment, intimidation and much worse because of their opinions. Does Megan Squire believe herself justified in painting her enemies in such broad strokes? Is she a fitting representative of the Elon University community in doing so? Regardless of whether she does, well... I've no other way to put this. At times I have encountered truly hate-filled people. Like neo-Nazis (got shot at by a gang of them) and the Westboro Baptist Church (had to spent several hours with them one hot summer night in a small television studio). From where I'm sitting, there is not a shred of difference between the "God Hates Fags" idiots and Megan Squire. One just happens to have a computer science education and a better web page. And also potentially has had her work lead to the injury of others if not worse. When the objective is hatred, the semantics matter none. And there can be no excuse or justifying that hatred. So, President Connie Ledoux Book and the trustees of Elon University: in keeping with the school's expressed beliefs in diversity of ideas and backgrounds and that the school should be a safe environment... when are you going to dismiss Dr. Megan Squire from the computer sciences department? Because having a hate-filled extremist in your faculty, and one so enthusiastically applying her work toward damaging and destroying the lives of others, is the kind of thing that - not to put too fine a point on it - might dry up the alumni contributions. It sure has mine. Having seen some of Dr. Squire's Twitter account, I cannot understand how anyone's life can contain so much anger and hatred. Much less that of a Ph.D.
As far as Squire's work from a purely academic perspective is concerned: she may be brilliant at Python databases but the bias factor of the data itself is so irredeemably out of whack that it's utterly useless beyond a political agenda. Raw data is supposed to be neutral, impartial, agnostic... and Squire's methodology is a betrayal of all of that and more. In short: she is not a serious scholar. That alone would merit reconsidering her status as a member of the faculty. Having such a malicious person intent upon causing grief to others certainly does not reflect well at all on whatever vestige of Christian values remain from the college's founding under the oaks in 1889. Which is more important: the reputation and integrity of an institution that many of us still hold dear in our hearts and memories? Or protecting an enabler of domestic terrorism out of some passing fad of "resistance"? Class of 1987 and I did not know that. I have given every year for 30 years. And I won't give to Elon again. Thanks for letting this be known. Saw your tweet. I will also be holding back on donations from now on. Like you said, hate is hate no matter the person who is hating. Elon is not any longer a place I want my children to be a part of. Graduated in early 80's and my wife did a few years later. Thank you. We are stopping donating. What Dr. Squire does is unethical and immoral and Elon should terminate her immediately.